Divided per saltire blue and white with the company initials in red on the white areas and white on the blue. Blue with a white band from upper hoist to lower fly, and on the center a monogram of the letters "A" and "C."
This company was a badly timed attempt by Arnold Bernstein to start up a tourist-oriented trans-Atlantic passenger service four months before the beginning of regular passenger jet service. Bernstein, a very successful German-Jewish ship owner, used the same flag. See National Geographic (1934) for his (non-US) companies in the 1920s and 30s before he was arrested by the Nazis and had his ships confiscated in 1937. He was released owing to his high international profile and emigrated to the US, where he resumed his shipping career. Horizontally divided blue over red with the initials AB in blue on a white lozenge. The flag is a white swallowtail bordered in red and inscribed with the company initials in blue. A subsidiary of Black Diamond SS Corp, using the same flag (black diamond on yellow) but with the initials of the name in the corners. American Diamond Line. This was one of the lines initiated by the United States Shipping Board at the end of WW1. The Board had been granted authority to build, buy, charter and operate vessels until 5 years after the end of the war though the Jones Act of 1920 did away with the 5 years requirement. However in most cases they paid managing operators to run the vessels and the American Diamond Line was one such service which was organized to trade between New York and Rotterdam/Antwerp and in 1920 was placed under the Black Diamond Steamship Corporation. Because of the unsatisfactory manner in which most of the management companies ran the vessels, the United States Shipping Board started ending these arrangements after 1920 but Black Diamond Steamship Corporation, who had over 20 government owned ships trading through the American Diamond Line by 1921, managed to convince the Board that they were doing a good job and were respected and reputable operators. This despite the fact that they were siphoning off the profits and keeping the American Diamond Line in the red and the Government were absorbing the "losses". In 1929 the American Diamond Line was put up for sale and there was a fight between Black Diamond Shipping Corporation and the Cosmopolitan Shipping Co. with appeals all the way through to President Herbert Hoover. Then in 1931 the Shipping Board decided to give preference to existing operators provided that they were able to reveal substantial assets. This Black Diamond Steamship Corporation was "able" to do although its assets only consisted of one ship in its own name. [Background sourced from "A Historical Dictionary of the U.S. Merchant Marine & Shipping Industry" by René de la Pedraja]. Canadian company Black Diamond Steamship Co. Ltd. of Montreal. Brown 1929 does show a flag for American Diamond Line of angled quarters of yellow and black [see A429 attached] whilst Brown 1934 onwards show a different flag in the name of Black Diamond Lines Inc. with the deletion of the letters. AEL was the leading US-flag company between the US east coast and the Mediterranean from 1919 to 1977. It was organized as the Export Steamship Corporation, but the word "American" was added in the 1920s to emphasize its ties to the US. For most of its history, the flag was red with a blue "E" for export on a white vertically oriented lozenge. Although Bonsor gives the flag as being adopted 1929, which means that there was none from the time of formation in 1919, it does appear in Brown 1929 which makes me wonder as it seems rather unlikely that it would make that edition if not adopted until that year. AEL was bought by Jakob Isbrandtsen, proprietor of the Isbrandtsen Line, in 1960. The purchase was approved by the US Maritime Administration in 1962, at which point the flag was changed to have the E superimposed on the outline of a globe instead of on a lozenge. The 1962-1964 flag was not retained when the company again became independent in 1973 as they then adopted a white flag with a narrow red band at top and a blue one at bottom with a narrow blue diamond touching both of these and charged with the white letters "AEL". My father was employed first through Isbrandtsen and then with American Export Isbrandsen, and then with American Export. This flag doesn't look right to me. Asking my father, he had expressed there were two different flags used 1973, of which the ships operated by AEL but were not owned by AEL flew this flag. Ships that were owned and operated by AEL had a similar flag (which I remember). It was similar the to flag shown but the red, white and blue were nearly equal thirds (maybe 2/7, 3/7, 2/7 ?) and although sort of resembling the Dutch flag, this flag had dark red and dark blue, much like the colours found on the US flag. In the middle was a dark blue lozenge that was more of a diamond shape than a square, and "AEL" in white in San-serif majuscuine lettering. Company also used this flag that I recall on their company pins, letterheads, etc. In 1950, AEL started using a blue, white, red wave line as an underline of the company name. The next year, they changed it to red, white, blue. This they kept using. The combination would also appear in other places, like three lines along the edge of a menu. The three lines continued to be used in the American Export Isbrandtsen Steamship Co. era. I guess that made them a symbol for all stages of the company, and it may be why they were used on the 1973 flag. American Export Isbrandtsen Steamship Co. In 1964, Jakob Isbrandtsen merged AEL with his other properties to form American Export Isbrandtsen, although the AEL name continued to be more commonly used. The flag added the 1962 AEL logo to the lower fly of the old Isbrandtsen flag. After heavy losses and unable to meet crippling debt payments, AEL went into bankruptcy in 1977, with Farrell Lines buying its remaining ships. Despite the name--and the original focus on the Hawaiian Islands, most of this company's history was spent primarily providing intercoastal (i.e., US Atlantic-to-US Pacific coast) and foreign services. Its owners shifted it away from the islands in 1916 to take advantage of high freight rates in the wartime North Atlantic and lost the confidence of the major sugar planting companies as a result. Captured by the billionaire shipping magnate Daniel K. Ludwig in a hostile takeover in 1955, after which the ships were sold off and the company closed down. Flag simply the white initials A-H on blue. One of the flags shown on the Belgian firm of Kennedy, Hunter & Co.’s list of agencies is that of the American Independence Line, New York. (There seems to be no connection with another shipping company, the American Independent Line of Chicago and New York). The flag has a strong resemblance to that of the American Star Line (same owner, perhaps?). On a white field is a middle horizontal stripe made up of red, white and blue horizontal stripes and over all, in the centre, is a white initial ‘I’ in black holding lines. The ‘I’ slightly overlaps the red and blue stripes. From the website of the National Maritime Museum, "the house flag of the American Mail Line Ltd, Seattle. On a light blue background, there is a yellow disc surrounded with a white band inscribed 'AMERICAN MAIL LINE'. In the centre of the disc is shown a flag striped horizontally in blue, white, red, white and blue [see American Mail SS Co, antecedent to American Mail Line]. The flag is made of a wool and synthetic fibre bunting. It has a cotton hoist with eyelet holes at the top and bottom. The flag is machine sewn and the design is printed. H. F. Alexander's Admiral Line started a service between Seattle and the Far East under the name of the Admiral Oriental Mail Line. The company was taken over by the Dollar family in 1922 and re-named the American Mail Line. The Dollar and American Mail Lines were taken over by the government to prevent their bankruptcy in 1938 and the former was re-named American President Lines. American Mail regained its independence at this time. Following privatization after the war, the company was re-acquired, by American President Lines in 1954. The use of the American Mail Lines name and flag ended in 1973." Service between Seattle and the Far East, begun by H. F. Alexander's Admiral Line under the name of Admiral Oriental Mail Line, in an attempt to diversify beyond the coastwise trade. Taken over by the Dollar family in 1922 and renamed the American Mail Line. Regained independence when the Dollar Line was taken over by the government to prevent its bankruptcy in 1938. Ownership went to American President Lines in 1954; APL merged AML into its own operations in 1973 and ended the use of the AML name. Flag five horizontal stripes of blue-white-red-white-blue, the same as the "C" flag of the International Code of Signals and the reverse of the swallowtailed flag of the old Pacific Mail Line, which the Dollars also took over in the 20s. Note: Stewart & Styring (1963) shows a different flag, blue with a logo consisting of the five-striped flag on a yellow disk surrounded by a white ring bearing the name of the line. Sources: National Geographic (1934), Stewart & Styring (1963), US Navy's 1961 H.O. Opposite the title page: Funnels and House flags of some Principal Steamship Lines in American Trade (http://www.archive.org/stream/scientificameric00hopkrich#page/n5/mode/1up) we find "American Mail Steamship Co."
White swallowtail with tapering edges, bordered dark blue and bearing a monogram: red initial “A” without horizontal stem above dark blue initial “M”, so national colours. This company preceded the one(s) mentioned above, as AMS apparently had paddle-wheel steamers in operation before 1850. This company was created by the US Shipping Board after WWI as a trans-Atlantic freight service. Like the United States Lines, it was sold to Paul W. Chapman in 1929, then repossessed by USSB and resold to International Mercantile Marine in 1931. It was merged into the USL in 1937. Formed as a trade name in 1924 with the ships placed under J.W. Winchester & Co. Inc. using a diagonal biband flag from upper hoist to lower fly, red over blue and overall the white letters "AML". Presumably retained after the 1929 sale to P.A. Chapman & Co. with no change until after 1931 which, after Chapmans defaulted on their payments which saw the service placed under United States Lines of Nevada in which International Mercantile Marine had an interest, controlling from 1934, saw the adoption of the United States Lines format of the 'eagle' flag, under which the letters signified which of the subsidiaries was operating a particular vessel, a format which lapsed in the 1930s. Brown 1934 and Loughran (1979) show the charges as black and have the eagle with wings displayed and inverted i.e. wing tips downwards. The colour difference may be a result of a dark blue confusion. The wings of the eagle seem to be common for portrayals of American companies and I wonder whether there is a requirement that commercial concerns differentiate in this manner or whether it is just that all the artists preferred this format. No, there is no such requirement, and many commercial concerns use the American eagle with wings displayed (i.e., tips upward, not inverted). But the version with wings displayed and inverted has been popular in the US almost since the adoption of the coat of arms in 1782, including such official uses as the earliest surviving infantry colors (1790s), military uniform buttons and belt plates, and President James Monroe's White House china. In fact, eagles with wings inverted were the norm on military colors and standards for infantry and cavalry until the early 1900s, when the army switched the pattern to the rendering on the modern die of the great seal, which was first cut by Tiffany and Co. in 1885. Even today, several government or quasi-governmental agencies use eagles with wings inverted, including the Federal Reserve and the National Gallery of Art. American Overseas Marine Corp., Quincy, MA - horizontal blue-white-blue-white-broad red-white-blue-white-blue flag; in center white "A". No information on this except the flag--an inverted red star on a white lozenge on a blue field. 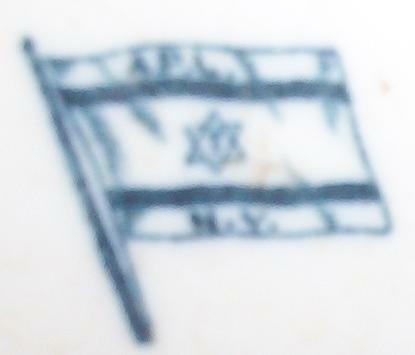 A vintage china plate features a flag very similar to the Israel flag with the addition of a T in the center of the 6 point star and the initials A. P. L. directly above the upper bar and the initials N. Y. directly below the lower bar. The markings on the rear of the plate indicate that this plate was manufactured between 1917 - 1930. This is the American Palestine Line, a shipping line based in New York (under Jewish ownership) which was active in the 1920s providing voyages to the Holy Land. I've done a New York Times database search which turns up a good deal of information confirming the identity of the flag as that of the American Palestine Line. There is one photograph of the flag (located here), flying in third position on the same line with the proto-Israeli and United States flags above. Apparently I was in error interpreting the "T" as a menorah; at higher resolution it looks very much like the Hebrew letter daleth (the left "arm" on the T is longer than the right "arm", which I can only guess stands for David (the hexagram is the "Shield of David", after all). I've also learned from reading articles that the Shield of David was painted on the funnels and that the American flag flew at stern, and the Zionist flag at the main masthead (I'm not sure if they were perhaps referring to the shipping company flag in that second reference or not). Interestingly, the prime vexillological point about the American Palestine Line seems to not be their own shipping company flag, which received nary a mention in the several Times articles (outside of the of the photo caption below), but their use of the standard "Zionist flag", i.e. the proto-Israeli flag, apparently the first time that flag was used at sea. This was considered a big deal at the time; there was a crowd of 5,000 at the first departure of the ship with a big Zionist ceremony with flags and anthems. Specifically, Jacob Strahl, the President of the company, said, "This event marks the advent of the first time in more than 2,000 years of the flag of Judea on the high seas". This somewhat dubious claim (of course the Zionist flag is a modern development) was echoed in the Times headlines. APL only ever had the one ship and failed within the year after three transatlantic crossing (apparently there were some legal/financial problems with the company, and even reports of some sort of mutiny). The passengers, I have read, were mostly tourists, not settlers. This reduced-size photo clipping is from the Nov. 30, 1924 New York Times. 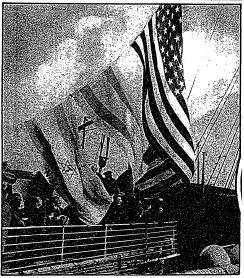 The caption is: "The first Jewish merchant ship: The Zionist flag, with the house flag of the American Palestine Line, flying with the Stars and Stripes over the Steamship President Arthur, purchased from the United States Government for a service between New York and the Holy Land." Sources: US Navy's 1961 H.O. Originated 1924 as a trading name of the United States Shipping Board, later the United States Maritime Commission, originally being operated by Atlantic, Gulf & Oriental Steamship Co. Inc. and under them the flag was similar but with a blue border and conventional red letters "AP". In the 1927/28 fiscal year the service was split into two with one part later becoming the American Gulf Line whilst the other amalgamated with two other trade names as a revised American Pioneer Line under Roosevelt Steamship Co. as operators. The flag became the green version as shown and this setup continued until 1940 when the United States Lines Co. acquired the trade name which continued in use until acquired by Farrell Lines in 1965. However the flag became that of United States Lines although exactly when appears to be disputed.